The CBS News investigative unit first reported this spring about the thousands of Americans forced out of their homes by defective, rotting drywall. Monday, the Consumer Product Safety Commission said it has found what it calls a "strong association" between some Chinese-made drywall and the corrosion of pipes and wires. But there may also be problems with American-made drywall, as CBS News chief investigative correspondent Armen Keteyian reports. The damage being blamed on defective drywall is ugly: corroded copper coil, electrical wires eaten away and a noxious odor fouling the air. Health complaints range from itchy eyes to headaches and bloody noses to breathing problems. "If it's doing this to our house, it has to have some effect on our bodies," said Jill Swidler, a Florida homeowner affected by the noxious drywall. Thousands of homeowners in 32 states have been affected. "This is devastating," said Sen. Mark Warner, D.-Va. "People are losing their homes; they're being foreclosed upon; they're declaring bankruptcy." It's believed that "bad" drywall produces corrosive sulfur gasses. The reason remains unclear, but lawmakers and federal authorities have left little doubt who's to blame: China, China, China. But a CBS News investigation has found problems with defective drywall may reach beyond China and include products made in the United States. 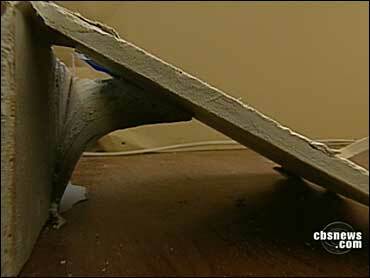 Early Show: Is Your Drywall A Rotting Health Hazard? The Consumer Product Safety Commission has received more than 2,000 complaints to date. The agency recently released details on 44 of them under the heading "imported drywall." But CBS News discovered that 10 of the cases - nearly a quarter - actually involve drywall made in the United States. That "says we need to be proactive in looking at all drywall," said Inez Tennenbaum, head of the CPSC. "The majority of our complaints has to do with the Chinese drywall - but we are not going to ignore a problem if it's made in America." In fact, CBS News found a number of families that had to abandon homes built, they claim, with American-made drywall. There were cases in Florida, in Georgia and in South Dakota, where Brandon Gades says his electrical wiring went haywire and his wife was overcome by fumes. In addition, three separate lawsuits have been filed against American manufacturers: one against National Gypsum, two others against Georgia Pacific, including one by Jill and Michael Swidler. "We don't have Chinese drywall," Jill Swidler said. "It was made in the United States." Drywall gained popularity with builders back in the booming 1950s as a way to frame walls - a lighter, cheaper alternative to plaster. Traditionally, drywall was made the white mineral gypsum. In its pure form gypsum emits no gas or odor. Bad drywall, however, is darker. CBS News wanted to compare American and Chinese drywall, so we purchased random samples of new American-made drywall in six U.S. cities, and new Chinese-made drywall in China. We also collected samples of drywall from five damaged U.S. homes. We sent everything to the University of Florida to be tested by a team of researchers led by professor Tim Townsend, a scientist and leading expert on the effects of drywall on the environment. His team spent five months running a multitude of tests on the samples we provided. The results were revealing. "It's not as black and white as saying the Chinese drywall is bad and all other drywall is good," Townsend said. As expected, the contaminated Chinese samples gave off high levels of sulfur gases. But all but one of the U.S. samples emitted sulfur gases, as well - not at levels as high as the defective Chinese product, but unexpected. Perhaps more surprising, "There were some American products that we tested that had higher emission than some of the new Chinese products that we tested," Townsend said. Nancy Spurlock, communications director for National Gypsum, says all their testing found no problems with their product. "Domestic wallboard, including National Gypsum, is not a problem," Spurlock said. "There's sulfur gasses everywhere. ... There's sulfur gasses in water. There's sulfur gasses in the air; to the extent they will corrode cooper, no." Georgia Pacific declined an on-camera request for an interview, citing pending litigation. but a company spokesperson said, "We take customer complaints seriously, and stand behind the quality of our products." Yet Townsend remains concerned about what could be hidden inside these walls. "The results tell me that we shouldn't just be focused solely on defective Chinese drywall," he said. "We need to be backing up and looking at the product of drywall itself."